These fantastic markers have some great fun features plus ventilated safety caps, secure caps, non-toxic ink and large reservoirs for long lasting action. 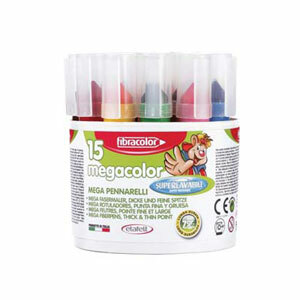 Fibracolor Mega Markers have a special sink-proof tip and thick barrel for comfort and easy grip. Bright and vibrant colour selections in each pack.